SEM images of microturbine. (a) Completed raceway with nested offset release etch visible. (b) Bonded device with turbine impeller removed. 2014 J. Micromech.Microeng. 24015021. B Hanrahan et. al. Figure 11. An article by alumni Brendan Hanrahan (MSE Ph.D. 2013) and Christopher Michael Waits (EE Ph.D. 2008) of the Army Research Laboratory, along with ISR Director Reza Ghodssi (ECE/ISR), has been selected as one of the Highlights of 2014 of the Journal of Micromechanics and Microengineering. Isotropic etching technique for three-dimensional microball-bearing raceways first appeared in 2014 J. Micromech. Microeng. 24 015021. It describes a multi-step plasma etching technique to fabricate deep-grooved micro-scale ball-bearing raceways. These raceways are critical in building multiple ball-bearing supported microturbines. The deep-groove geometry employed can handle mixed axial and radial loads, allowing for stable, high-speed operation compared to previous iterations of the microball-bearing raceways. The multi-step, inductively coupled plasma-based process is optimized to obtain <2% deviation amongst intended raceway depth, width and curvature. Etching non-uniformity is measured to be 0.15% within the raceway of a single device. The bearing dynamics with the new deep-groove geometry have been simulated. The deep-groove raceway, packed with off-the-shelf precision ball-bearings provides a stability improvement over previous demonstrations of high-performance rotary micromachines operating at high speeds. 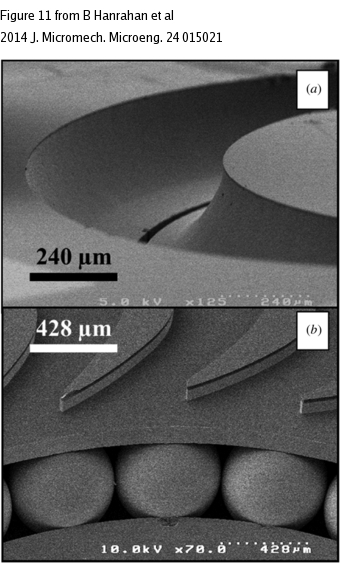 Highlights of 2014 is a showcase for the exciting research across all areas of MEMS and microscale research that the Journal of Micromechanics and Microengineering presents. The chosen articles were identified by a team of expert referees and the journal's editorial board as some of the highest-quality papers published in 2014. This paper concludes 25 years of research on microball bearings by Reza Ghodssi and his research group. Both Hanrahan and Waits are former students of Ghodssi. Ghodssi started the work in 1990 as a Ph.D. student at the University of Wisconsin and brought it to Maryland when he joined the faculty here. Over the years, MSAL has produced 22 papers covering the range of devices and science related to microball bearings, many in conjunction with the Army Research Lab in Adelphi, Md. Recent work includes this study of isotropic etching, and others on adhesion, wear, and vibration. Hanrahan has been at ARL in the Sensors and Electron Devices Directorate since 2009. His research interests currently include the development of new materials and fabrication techniques for power and sensor applications, novel 3D printing materials and structures, and the development of MEMS components for compact, portable power systems. This is the second paper for which he has received the Journal of Micromechanics and Microengineering’s highlights honor. In addition to his engineering efforts, Hanrahan is also known for co-founding the non-profit corporation Cupid Charities, which runs the world-wide Cupid’s Undie Run event series. To date the organization has raised more than $2M for the Children’s Tumor Foundation, a not-for-profit that funds treatment and research toward neurofibromatosis, a disease can lead to painful tumors that grow on nerves and lead to blindness, disfigurement, cancer and other ailments. The event, which started in Washington, D.C. in 2010, is now held in 35 U.S. cities and in Australia. It was featured in a February 2015 Washington Post article.